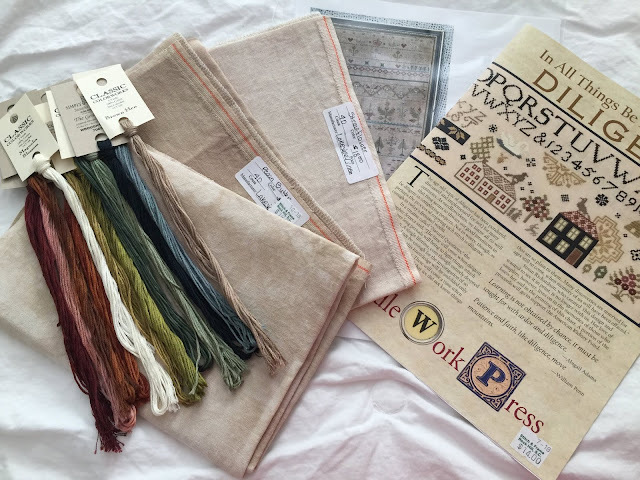 Merrily, Merrily We Welcome Spring by Blackbird Designs - 36 ct. Oaken By Picture this Plus, called for hand-dyed cotton threads (1 over 2). 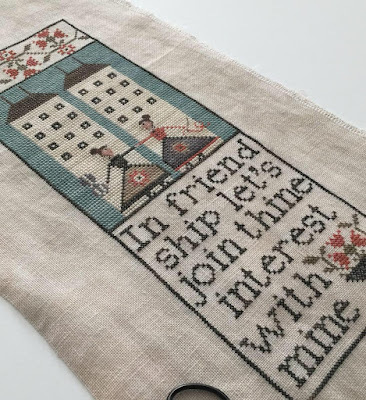 Pink House Sampler by Plum Street Samplers - 40 ct. Park City Blend by R&R, called for cotton theads (1 over 2). 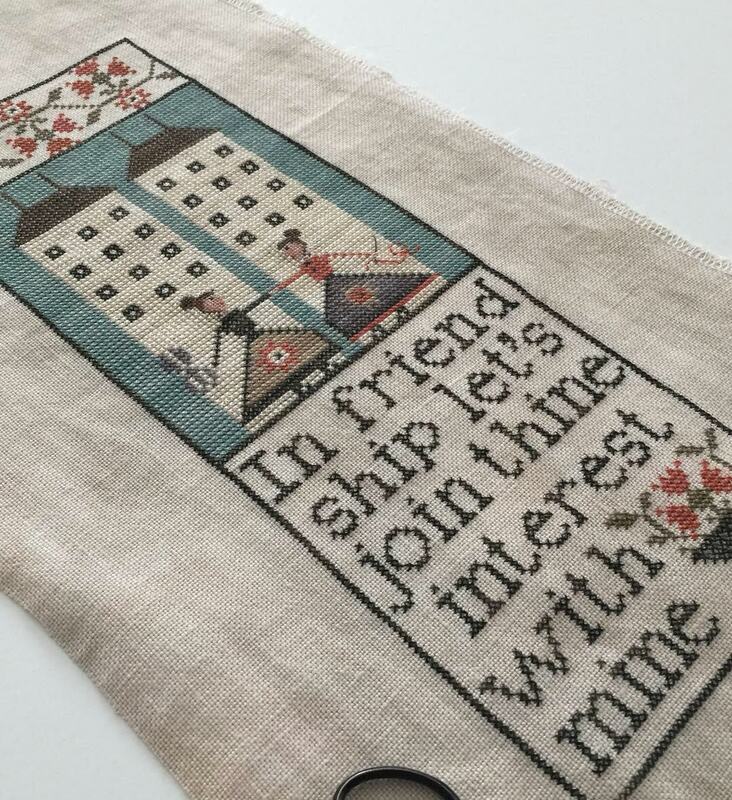 Soul Sisters by Plum Street Samplers - 32 ct. Bramble by Picture this Plus, called for cotton threads (1 over ). 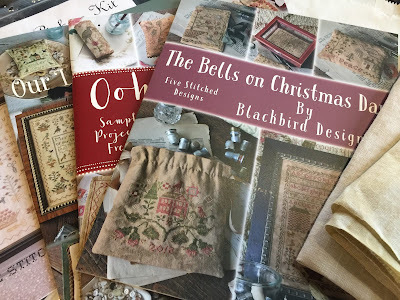 From The Stitch & Frame Shop in Rock Hill, SC - Blackbird Designs Books - Our Lasting Friendship, Ooh La La and The Bells on Christmas Day. Two fat quarters of 36 Picture this Plus linen - Heartland and Sand. 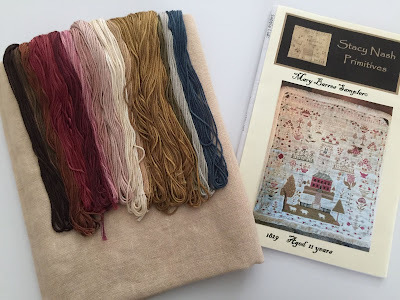 A Gentleman's Daughter by Plum Street Sampler and The Stitching Life by Heartstring Samplery. 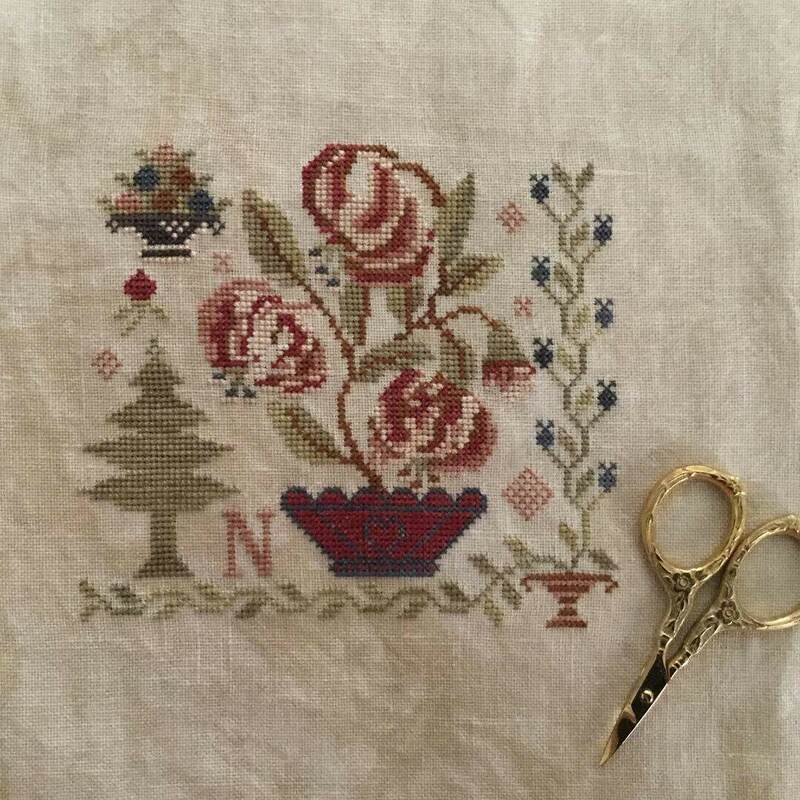 From Fire Poppies - When Flowers Bloom by With Thy Needle & Thread, Thread Drops and 40 ct. Old Massachusetts Linen. 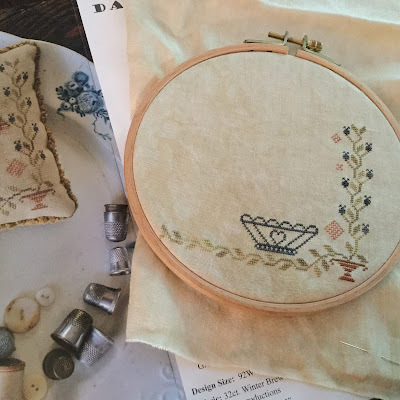 From Country Sampler in Spring Green, WI - Jane Tindall by NeedleWorkPress and Mary Barres Sampler (complete kit) by Stacy Nash Primitives. 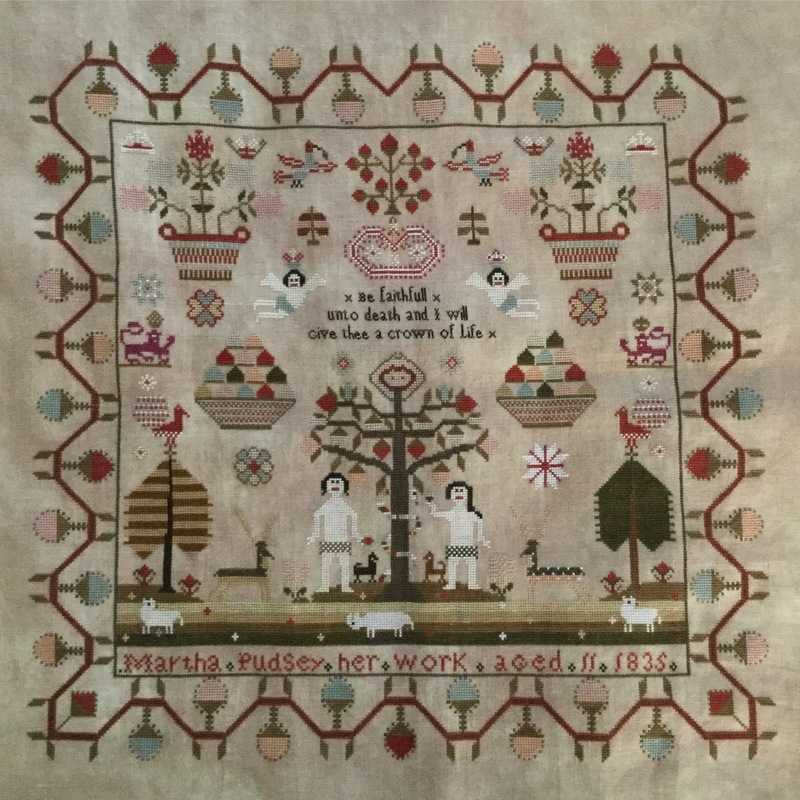 From Pineberry Lane - Anne Marston 1843 (e-pattern). Sarah Redfearn by The Scarlett House - 40 ct. Vintage Examplar by Lakeside Linens and the called for silk threads with two exceptions: I used Gentle Arts Lexington Green instead of Belle Soie Shepherd's Pasture and Belle Soie Tortoise Shell instead of Belle Soie Chocolat. Cosmic Girl by Nadia Cretin-Lechenne - Hedgehog Fibres Skinny Singles in Graphite and Cheeky. From Country Sampler in Spring Green, WI - threads and linen for Ann Wright. 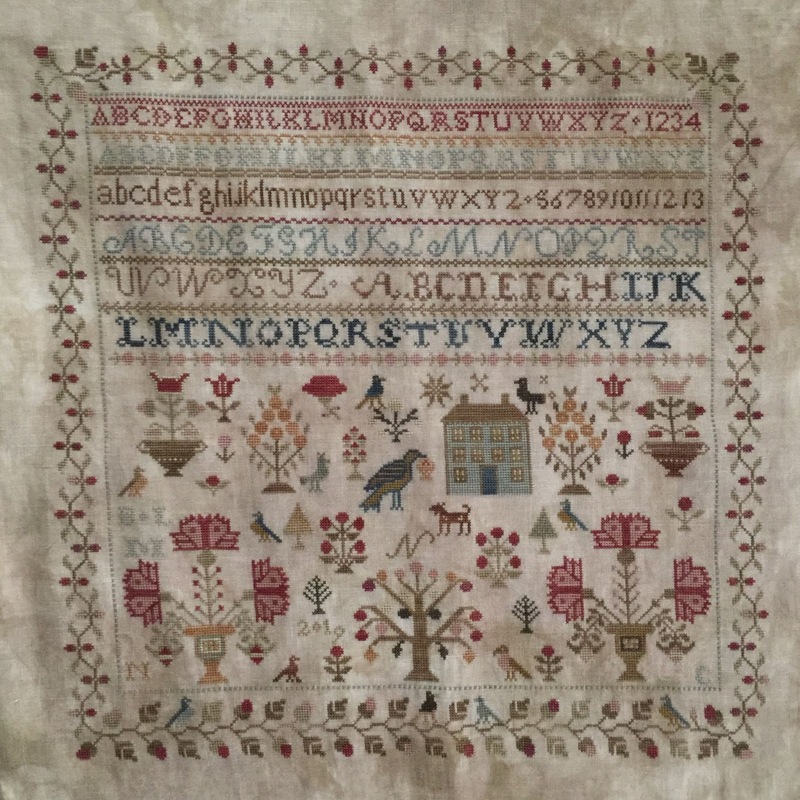 Spring at Hollyberry Farm by Stacy Nash Primitives - 36 ct. Legacy by Picture this Plus, Gentle Arts Sampler Threads (1 over 2). 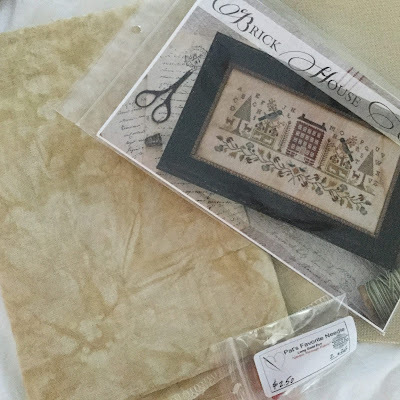 Milk & Cream Co. by Plum Street Samplers - 40 ct. Vintage Pecan Butter, cotton threads (1 over 2). 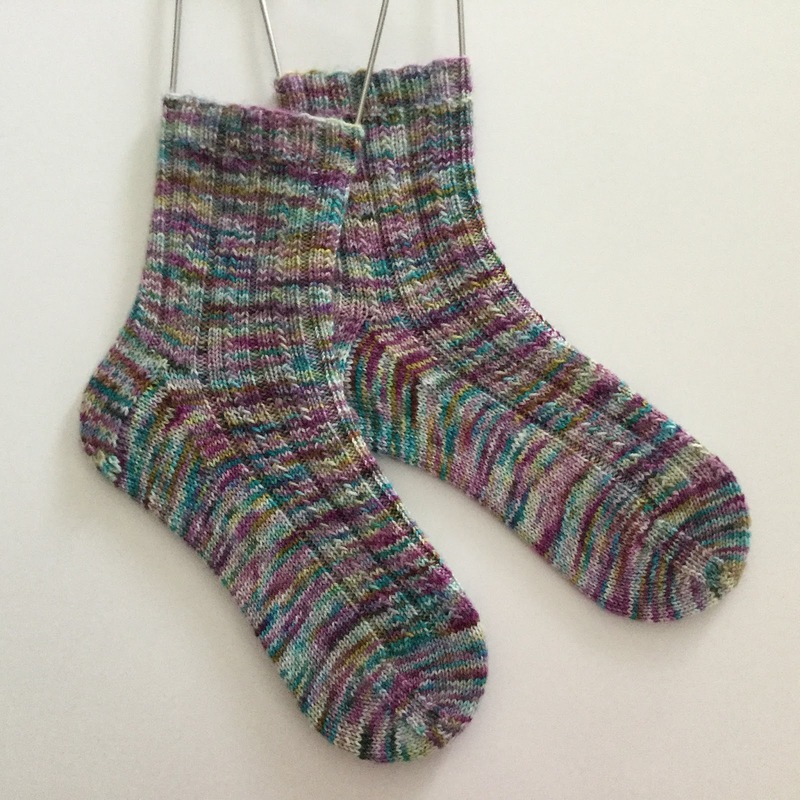 Snowflower by Heidi Kirrmaier - Cascade 220 Superwash - Charcoal, Silver Gray and White. Chevron Baby Blanket by Espace Tricot - Hobby Lobby I love this Cotton - Pewter, Dove and White. Spa Day Facecloth by Anne Mancine - Hobby Lobby I Love this Cotton - Pewter. Plum Street Samplers - Hen Peck, Milk & Cream Co., Soul Sisters and True Friendship. 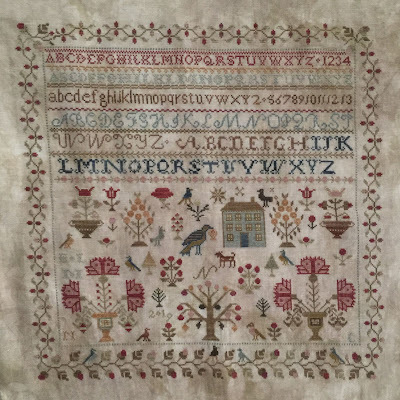 Stacy Nash Primitives - Spring at Hollyberry Farm. 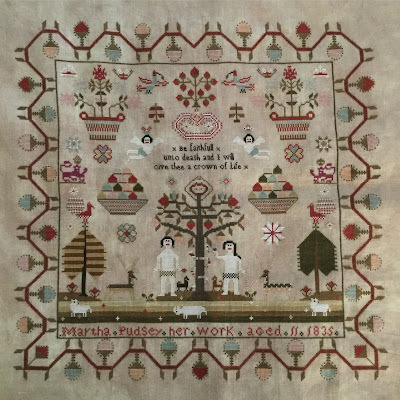 The Scarlett House - Mary Cook 1795. With Thy Needle & Thread - Good Deeds. 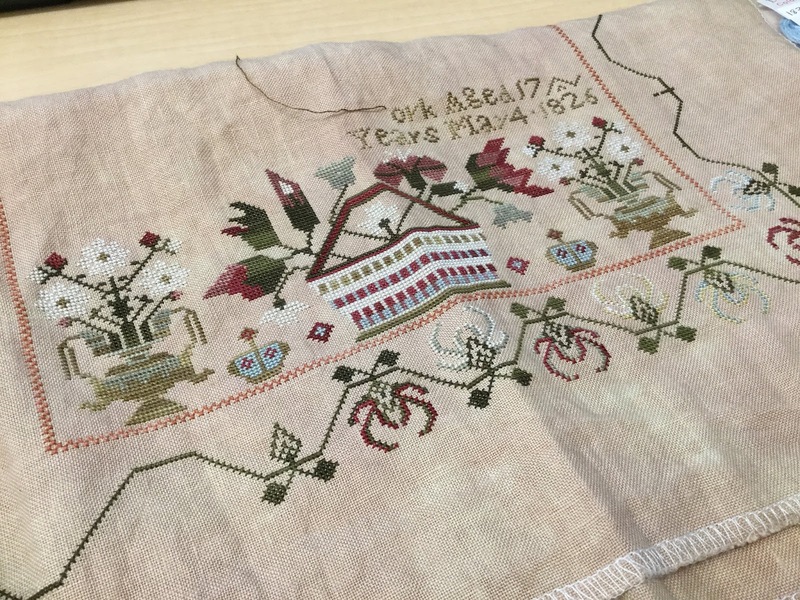 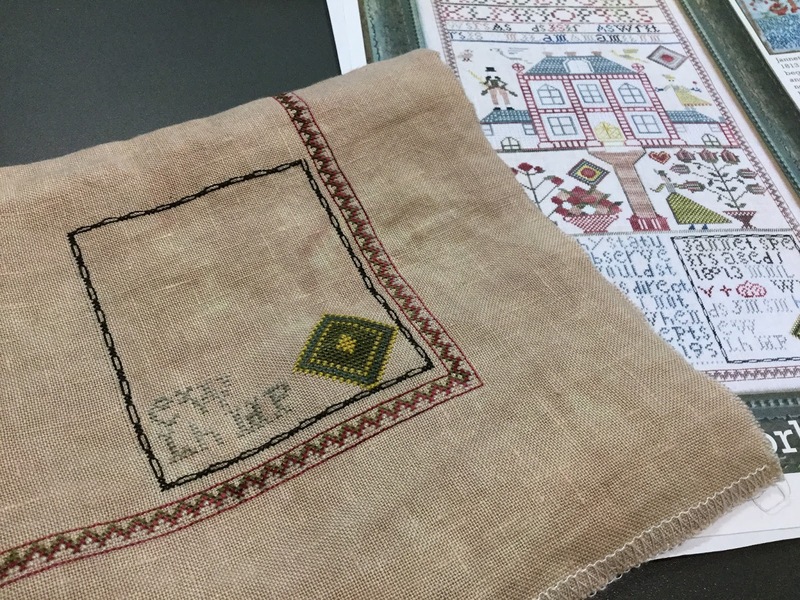 From the Country Sampler in Spring Green, WI - Sarah Casey Unwin 1848 by Chessie & Me with 36 ct. linen and cotton hand-dyed threads and Jane Stanwix 1843 by Samplers Revisited also with 36 ct. linen and cotton hand-dyed threads. Frederick by Carriage House Samplings - 40 ct. Pearled Barley, NPI silks (1 over 2). Harriette Elizabeth Coe by Brenda Gervais - 40 ct. Vintage Lt. Examplar, various hand-dyed cotton threads (1 over 2). 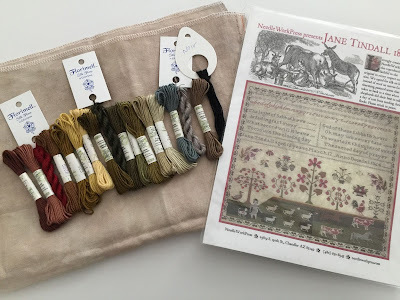 Jannet Speirs by NeedleWorkPress - 40 ct. Vintage Examplar, Belle Soie silk threads (1 over 2). 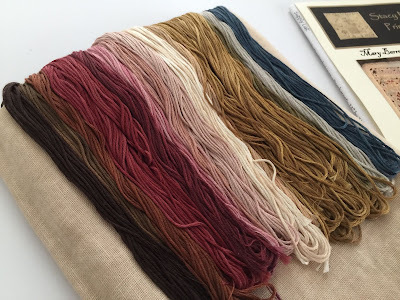 Ann Grimshaw 1818 by The Scarlet Letter - 40 ct. Vintage Country Mocha over-dyed with tea and coffee, Vikki Clayton Hand-Dyed Fibers Basic Black (1 over 2). Oct. 31st by With thy Needle and Thread - 40 ct. Legacy by Picture this Plus, hand-dyed cotton and silk threads (1 over 2). 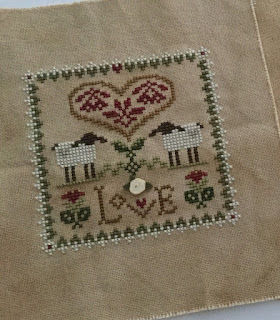 Love Never Fails by Barbara Ana Designs - 40 ct. Vintage Meadow Rue by Lakeside Linens, DMC (1 over 2). 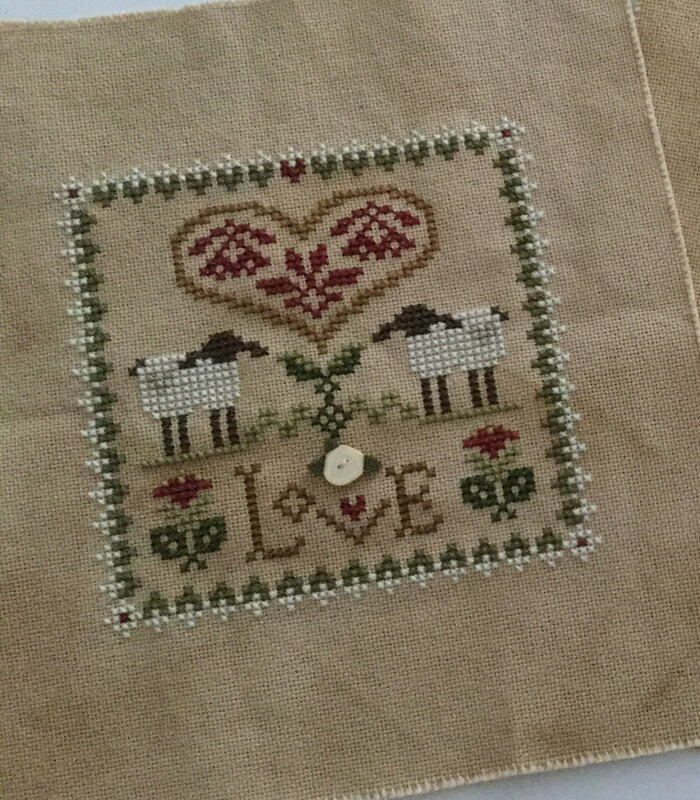 Little Sheep Virtues - Love by Little House Needleworks - 28 ct. Tea/Coffee Dyed Monaco, DMC threads (2 over 2). 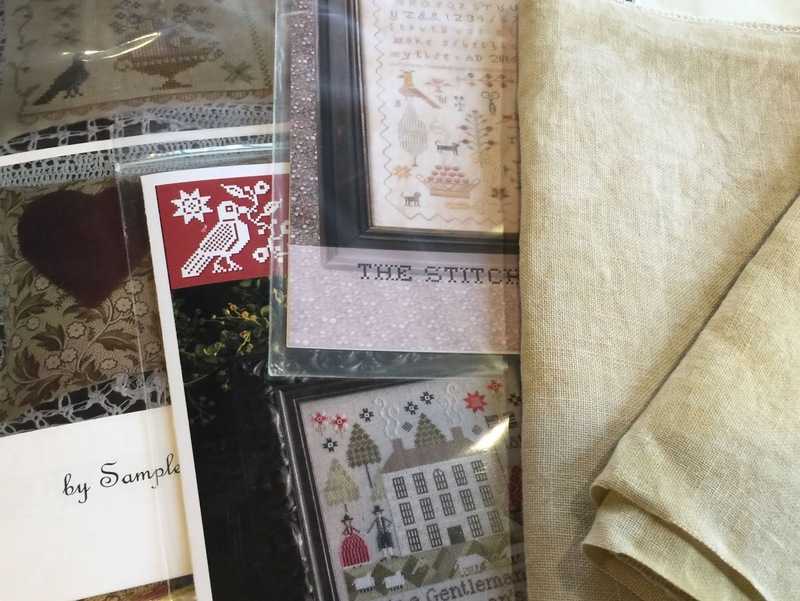 Birds of a Feather by Blackbird Designs - 40 ct. Legacy by Picture this Plus, NPI silks (1 over 2). 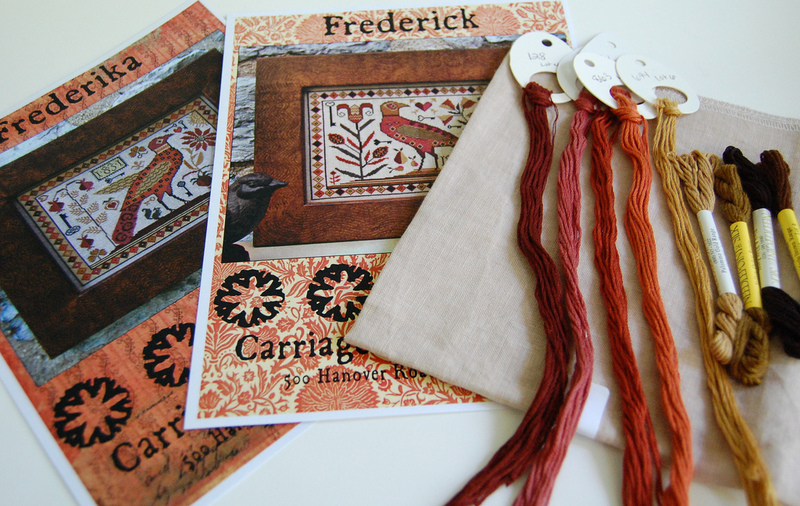 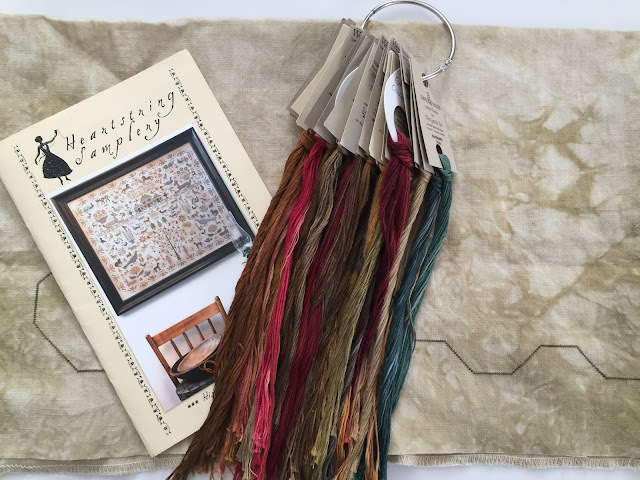 Frederick by Carriage House Samplings - 40 ct. Pearled Barley by Lakeside Linens, NPI silks (1 over 2). 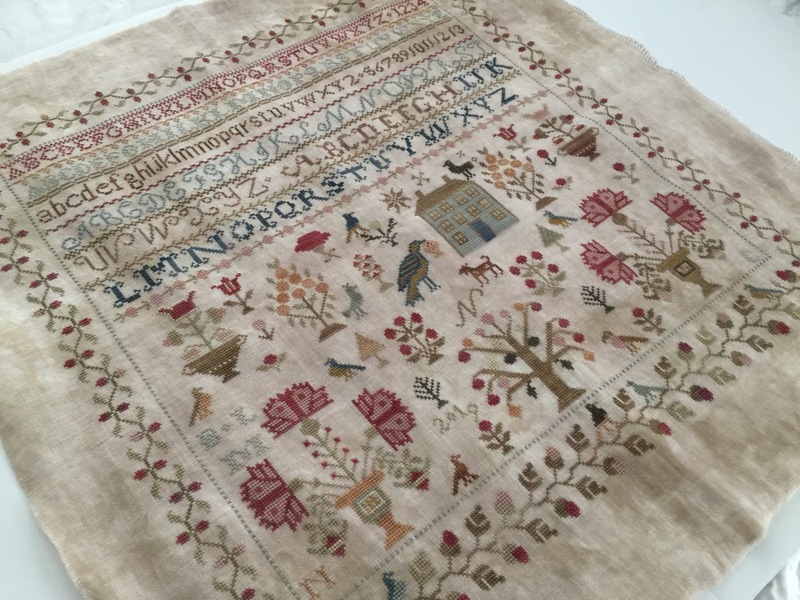 From Down Sunshine Lane - Potting Shed by With Thy Needle & Thread and 1842 SAW Sampler by Threadwork Primitives. 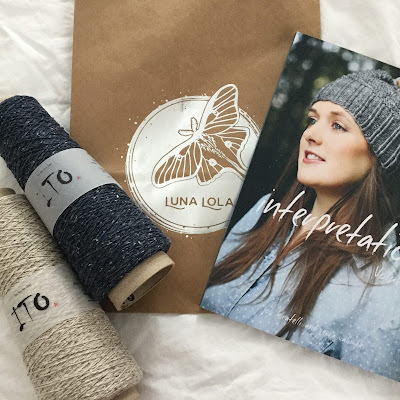 Sunset Highway Sweater by Caitlin Hunter of Boyland Knitworks - Madelinetosh Twist Light - Leopard, Birch Gray and Grey Gray Owl and Yarn Experiments Monkey Sock - Meet me in Charlotte.